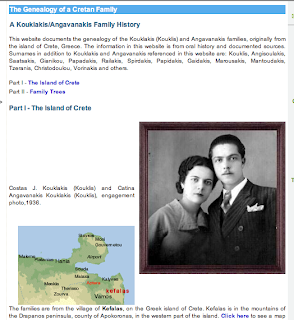 This website documents the genealogy of the Kouklakis (Koulis) and Angavanakis families, originally from the island of Crete, Greece. The information in this website is from oral history and documented sources. Surnames in addition to Kouklakis and Angavanakis referenced in this website are: Kouklis, Angisoulakis, Saatsakis, Gianikou, Papadakis, Rallakis, Spirdakis, Papidakis, Galdakis, Marousakis, Mantoudakis, Tzeranis, Christodoulou, Vorinakis and others.